On Monday Empire Sports broke news of an incident involving troubled pop-star Justin Bieber having a bad encounter with NBA star Blake Griffin’s hand. Social Media was abuzz and many outlets reported conflicting stories of the incident. Notably quiet after the incident was Bieber himself. He made no posts on his Twitter or Facebook accounts after the incident and no media outlets were able to elicit a response. We attempted ourselves to make contact with Justin regarding the incident but he refused to comment. The story was destined to fade from the public’s memory.. that is until today. Early this morning we received an anonymous submission of leaked photos of Bieber who can be seen clearly bruised on one side of his face. 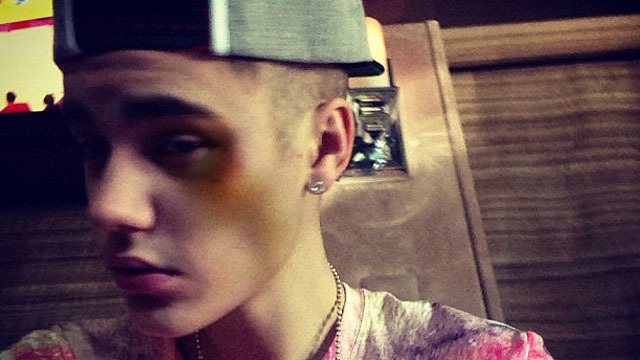 A series a photos, which appear to have been taken on a cell phone camera, show Bieber with a large bruise covering one side of his face, a swollen lip and a black eye. It’s unknown how long after the incident these photos were taken. We are still waiting to hear from Justin but these new photo certainly makes a statement of their own. We will have more news on the story as it breaks. Previous: Lebron James Challenges Aaron Rodgers To A Basketball Versus Football Shooting Showdown.